The Mount Nimba range is a transboundary forested massif which extends from northeastern Liberia into southeastern Guinea and western Côte d’Ivoire. Rising to a maximum altitude of 1,752 m, Mount Nimba is one of the highest elevation forest ecosystems in West Africa. The mountain range encompasses striking landscapes of steep valleys, plateaus, sharp cliffs, and exposed rocks. The Mount Nimba range remained a forest refugium during past glacial periods, when surrounding landscapes became covered by savanna, giving the range biodiversity unparalleled on the continent. It contains original and diverse species of the most remarkable animal and plant populations, notably threatened species such as the Micropotamogale of Mount Nimba, the viviparous toad of Mount Nimba and western chimpanzees. As the source of several important rivers, including the Cavalla and St. John, the mountain range also plays an important role in the regional water cycle. ount Nimba region saw an influx of people fleeing the areas of unrest. During that time, in the absence of forestry law enforcement, major logging activities were carried out in the forest, bush meat was hunted on a large-scale, and slash-and-burn agriculture expanded. 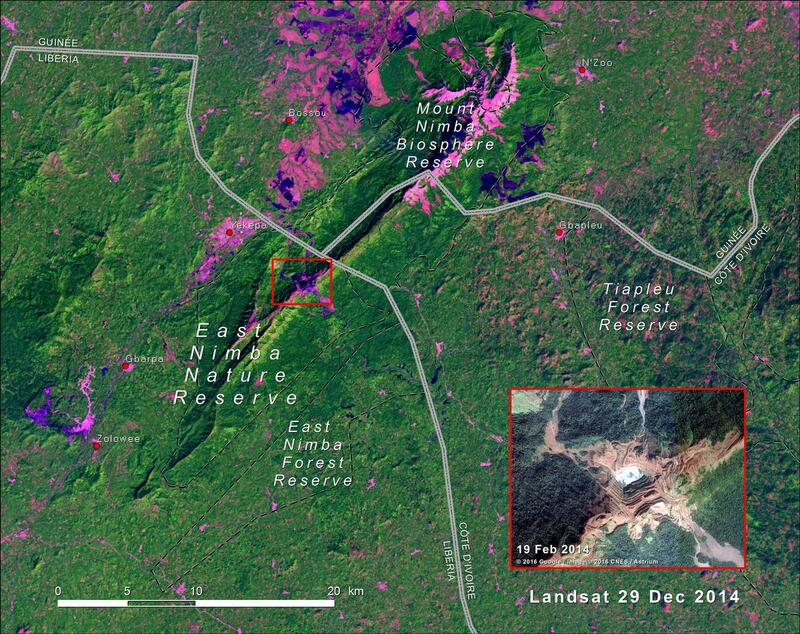 By 2014, forest cover had been greatly reduced in the Mount Nimba area. The East Nimba Forest Reserve had lost about half of its 1974 forest cover to encroachment by agriculture and settlements. 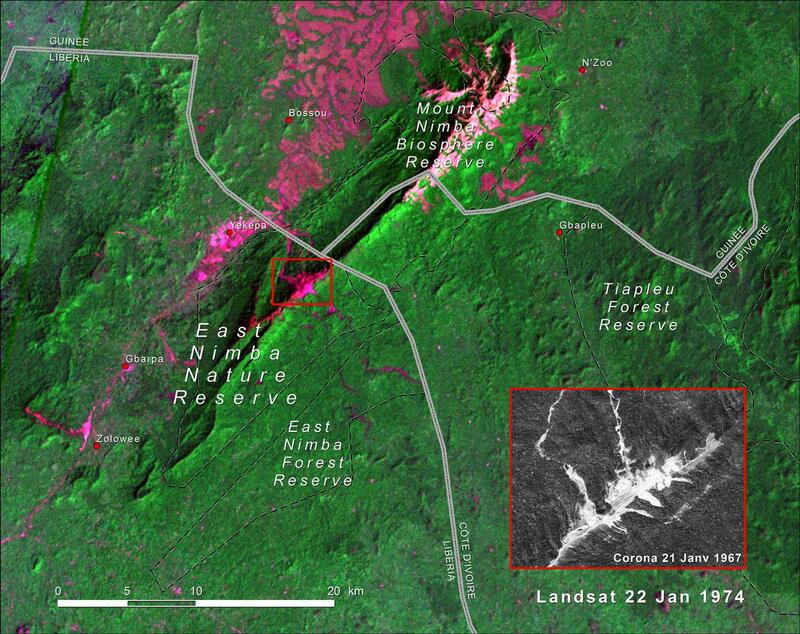 The slopes of Mount Nimba had been deforested, causing soils and mineral waste to wash downhill and silt the rivers. The legacies of former mining activities, such as the carved terraces and the open pit depression called the Blue Lake, are still visible on the land and altered the landscape of the mountain ridge (see inset above and adjacent picture). In response to concerns about the pressures from mining operations and population growth, the East Nimba Nature Reserve of Liberia was established in 2003 with the primary conservation objective of preserving Mount Nimba’s high and unique biodiversity. Covering over 135 sq km of mostly montane tropical forest, the reserve follows earlier conservation efforts in Côte d’Ivoire and Guinea — Mount Nimba Strict Nature Reserve in 1944 and Mount Nimba Biosphere Reserve in 1980. Field reports indicate a slight recovery of the vegetation cover since the establishment of the reserve.